Premier offers a wide range of quality solar panels to supply the various needs of our battery energizers and the diverse solar input situations across North America. Location where the energizer will be used. Time of the year that the energizer will be used. 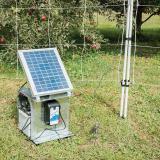 Note: Also available, solar panels with 10 amp regulators (see below). Attaches to a rechargeable 12 volt battery to recharge the battery and increase its usable life. Width 14" 14" 20" 25" 25"
Length 11.81" 22.68" 21.29" 21" 30"
Depth 0.71" 0.91" 1.38" 1.38" 1.5"
Helps reduce the drain on your battery by pumping power back into it. 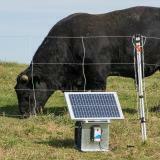 Can also be used with Solar Panel Brackets and an Energizer Support Box. The rapid increase in solar panel manufacturing capacity has forced down the prices Premier must pay per watt per panel. We're very pleased to pass on the savings to you. The quality remains as good (if not better). 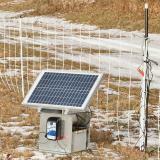 Solar panels should be attached directly to the 12 volt deep cycle battery terminals or through a voltage regulator. Make sure to place in the sun. Keep the panel clean. The sun can not get through dust, snow, ice and bird droppings. Can be used in winter, but needs to remain clear and battery must be above 40 percent charged or it will freeze. 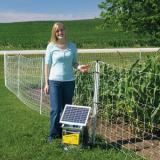 Regulators should be used in conjunction with a 20 watt panel or larger. Test just the energizer on the battery. 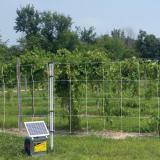 Solar panel should have an output of 15 to 21 volts in full sunlight. Note: Warranty covers the efficiency of the cells only and does not warrant the glass, frame or cells against breakage caused from weather or abuse. 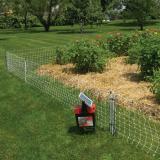 Premier's 30 day guarantee covers products that return undamaged and at original functioning level. If properly sized to your battery, available sunlight, and energizer, our solar panels will not disappoint. Seldom do we have one sent in for failure (our Repairs department want us to stress this point, these panels do not fail). They can take a lot of abuse and still pump a charge into your battery. They use blue polycrystalline cells which are more efficient per unit area than brown or black celled panels. Prices for solar… Read More » panels are lower than what they were only a few short years ago. 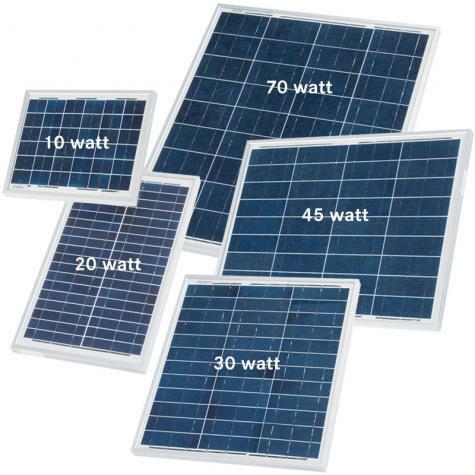 They are of excellent quality and the cost per watt per panel is low. Not sure how to rate this as I haven’t received the product yet. As a word of advice if you intend to purchase a solar panel be sure to either order the voltage regulator (in the same order) or call them and let them know you already have one. I ordered the battery and voltage regulator and my uncle ordered the panel. My order arrived and the solar panel didn’t ship (to the same address) because they were worried about the voltage regulator. To be fair they called and he missed the call. He also didn’t return their call but he assumed they would ship the order regardless. They didn’t. Now I have animals that need power to their netting and I am short one component and I will have to wait an additional (3) days for the panel. Premier 1 I appreciate what a great company you are for doing your due diligence but you do specify on your page the recommendation for the regulator. Please just ship the order next time. Works great. haven't had to bring in battery to charge it. Set it and forget it. Attached it to the support box w/battery and it works great!